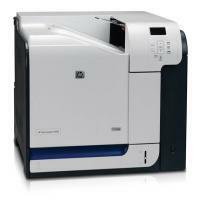 The HP Laserjet Cp3525 aims at small offices, producing sharp and bright documents. The printer helps in increasing the productivity by offering expandable paper tray and producing outputs with high print speed. The printer is easy to maintain as it has long lasting HP Laserjet Cp3525 toner cartridges. The device runs on 515 MHz processor and 512 MB of RAM which is further expandable up to 1 GB. It has a four line colour screen on the control panel with different control buttons. The device weighs 33 kg approx. and measures 20.2 x 19.3 x 14.1 inches respectively. The printer supports high speed USB 2.0 connectivity. It also has an EIO expansion slot for optional storage. It has a 250 sheet input tray and a 100 sheet multipurpose tray. The HP Laserjet Cp3525 has a top up output bin which can store up to 250 printed sheets. The printing resolution of this printer is 1,200 x 600 dpi with print speed up to 30 ppm for both colour and monochrome documents. It also offers an optional 500 sheet input tray for high volume printing. The printer uses HP ImageRET 3600 technology and HP's ColorSphere toner to produce sharp images and clear text. The HP Laserjet Cp3525 printer is an ideal solution for small offices and home users as it produces quality results with print speed up to 30 ppm. The printer uses HP ImageRET 3600 technology and HP's ColorSphere toner to deliver sharp texts and bright images. It also supports USB connectivity and EIO expansion slots for optional storage. The long lasting HP Laserjet Cp3525 toner cartridges, eliminates the need of replacing the cartridges constantly. Is your HP Laserjet Cp3525 printer producing texts with a gray background? First of all before you proceed with the troubleshooting steps below, make sure you are using good quality HP Laserjet Cp3525 toner cartridge. First thing first. Make sure the printer’s media input tray is properly placed. If not, adjust it to the right location and make a test print. If the printout quality improves by this action, you can stop the troubleshooting right here. You can also check if the HP Laserjet Cp3525 Toner Cartridge is placed properly and is not damaged or leaking. If you find any fault with the cartridge, you need to replace this one first before you proceed. Change the media to a lighter basis weight. To do so, you will find the instructions and specifications in the ‘Printer Media Specifications’ section of user manual you got with the printer. Check the printer’s environment. Very dry (low humidity) conditions can increase the amount of background shading. So you need to change it to medium dry. If none of the above steps work, you would need to install a new HP Laserjet Cp3525 toner cartridge. Q. While buying original HP Laserjet Cp3525 toner cartridges, each time the printer toner replacement costs me much. Please suggest me some low-cost toner cartridges that can provide good quality prints. A. We would recommend you to buy compatible HP Laserjet Cp3525 Cartridges for your printer. The main difference between compatible and the original ones is the difference in cost. The compatible toner cartridges will save upto 50% of your money, as compared to the original ones. Also, they produce impressive results as the original ones. These compatible toner cartridges are available at Printerinkcartridges.ie and comes with 100% satisfaction guarantee. We offer both coloured as well as black coloured toner cartridges. Both single pack and multiple pack toner cartridge are available here. Q. What if I’m unable to install HP Laserjet Cp3525 toner cartridges, purchased from your site? A. You can ask for help at 019610106 or contact us by email at info@printerinkcartridges.ie . Q. What makes the HP Laserjet Cp3525 printer, more suitable for small offices? A. The printer produces sharp and bright documents. The printer helps in increasing the productivity by offering expandable paper tray and producing outputs with high print speed. Also, it is very easy to maintain as it has long lasting HP Laserjet Cp3525 toner cartridges that do not bother us regarding the cartridge replacements. Q. Does the printer support USB connectivity and EIO expansion slots? A. Yes, the printer supports USB connectivity and EIO expansion slots for optional storage. Q. What does the ‘8X.YYYY EIO ERROR’ message in the control panel indicates? A. This message indicates that the EIO card in slot X has failed. Q. In what order should I install the toner cartridges for my HP Laserjet Cp3525 printer? A. You must install the correct colour cartridge in each slot. From left to right, the cartridges should be installed in this order: Yellow, Magenta, Cyan and Black. Q. Can I empty the toner collection unit of my HP LaserJet CP3525 and reuse it? A. Sorry. The toner collection unit cannot be emptied or reused. It is meant for single use. Reuse of toner collection unit may cause spillage of toner in the interior of the product which in turn may degrade the print quality. Hence, it is best advised to replace the toner collection unit when the control panel prompts you to do so. Q. If I purchase HP Color LaserJet Pro MFP M181fw printer I'll get a black toner cartridge along with the product. Is the case same with HP LaserJet CP3525 toner cartridges? A. Yes. One black colour HP LaserJet CP3525 toner cartridge is provided with the printer. In fact, on every purchase of HP printer, a toner cartridge is provided in the box. Q. The HP LaserJet CP3525 printer is feeding multiple sheets together. What should I do to prevent this? Following the mentioned points will certainly keep this issue at bay. Q. Can I use HP LaserJet CP3525 toner cartridges in any other HP LaserJet printer? If so, please list them. Q. Why should I choose HP Laserjet Cp3525 printer over the innumerous others available in the market? A. HP has carved a niche for itself in the computer industry and its printers also follow its league. They are way beyond the others available in the market and are very user-friendly. With HP service centres available everywhere, servicing the printers should never pose a problem. The perfect quality print outs are the best in the market. Q. What are the added advantages of HP Laserjet Cp3525 printer? A. This printer has USB connectivity and EIO expansion slots for added storage which makes it very practical for office and home use. Q. Are the Hp Laserjet Cp3525 toner cartridges compatible with any other printer? A. The Compatible HP Laserjet CP3525 toner cartridges are specially designed to fit in multiple printer models. This adds to the convenience of the user and one does not get bounded to a particular printer only. Q. Is the printer user friendly and can I install it without any help? A. The installing instructions are written in an easy to understand way in the instruction manual and one can easily install the printer without any outside help. The instructions are also available online in HP’s website. Q. For how long do the HP Laserjet Cp3525 toner cartridges last? A. The cartridges last quite long which eliminates the need to constantly replace the cartridges. The black and other three colour toner cartridges have different ink volume. Whereas the black colour toner cartridge would last up to 10,500 pages (with 5% coverage area), the other three colour cartridges would last up to 7000 pages each (with 5% coverage area) . This ensures flawless printing experience in projects which involve heavy duty printing. Q. Do these cartridges leak or dry up if not frequently used? A. Any cartridge would dry up if stored for long when not in use. It is advisable to at least use the printer once every month to ensure the flawless working of the printer. Q. Can I print quality pictures with the HP Laserjet CP3525 toner cartridges? A. The cartridges have superior quality ink and can print bright images with clear and bold texts. Q. HP is branded as one of the best in laptops, does its printer range also lead the market? A. Once purchased, the printers run hassle-free without any problems. The small errors or problems which may crop up can be easily rectified using the online guidance provided by the HP website. Q. Will I get a refund guarantee in case I am not satisfied with the printer? A. The company gives a 100% money-back guarantee if the customers are not satisfied with the product. This proves the authenticity of the product. Q. Can I refill the HP Laserjet Cp3525 toner cartridges and for how many times before replacing it? A. Refilling toner cartridges can be hazardous if not done with proper guidance and it is recommended not to refill the cartridges. The compatible ones are easily available at low cost and it is suggested that one goes for the compatible ones rather than trying to refill. Q. Can I buy the cartridges in bulk and store them without the problem of them drying up? A. Buying these compatible toner cartridges in bulk would be great only when your printer is associate with heavy printing jobs. Bulk buying would reduce your overall printing expenses without compromising the quality. The compatible HP Laserjet toner cartridges offered by PrinterInkCartridges.ie (above on this page) will last up to 6 months before they start drying out. On the plus side we also offer replacement guarantee on all the cartridges on site. So, we suggest you to go for the multipack listed above to cut down a large chunk of your printing budget. Just remember to keep them sealed pack until you are ready to install them. Q. Can the HP Laserjet CP3525 fax as well as print? A. No, the printer does not have a fax option. Q. Can I install only the black cartridges in all the 4 slots instead of the cyan, blue and magenta? A. The printer chip is devised in such a way that all the cartridges need to be installed in their correct places else the printer would not be able to read the chips correctly. Q. Does the printer have any resale value? A. Leading the market in computers and printers, HP printers have a great resale value if sold in a working condition.